Last week the Washington Post printed an editorial dismissing the need to build high speed rail in the United States (A Lost Cause: The high-speed rail race). You may recall that I traveled on Spain's impressive high-speed rail system this last summer, which I reported here. I also responded to an op-ed by Robert J. Samuelson back in November with a 4-part blog series (1, 2, 3, 4) that addressed the issues raised in this op-ed plus some others. A key reason we need to invest in rail is for diversification. Diversification is an indispensable strategy when it comes to investment portfolios, but for some reason, op-ed writers seem to overlook this important consideration when opining on rail systems. For decades we have invested in transportation systems that are virtually 100% dependent on petroleum availability to function. High speed electric rail is not. 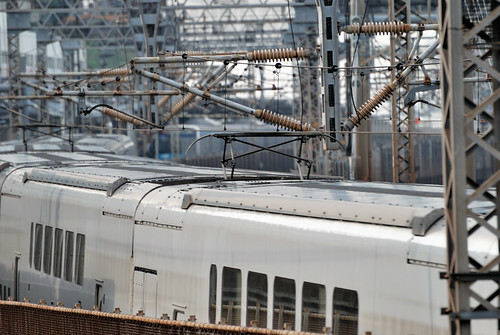 Powering trains with electricity allows for fuel flexibility--the energy can come from any source that can generate electric power: coal, solar, wind, nuclear, hydro or whatever. It is not bound to the price and availability of oil. Oil is certain to become more expensive and may also become scarcer over the next decade or two, making our existing investments in highways and air travel look like the dot-com boom of the late 90's. Better to diversify our investments now, since it takes time to get them built and operating--time that we don't really have enough of. A follow up post addressing another key flaw in their argument will be forthcoming shortly.